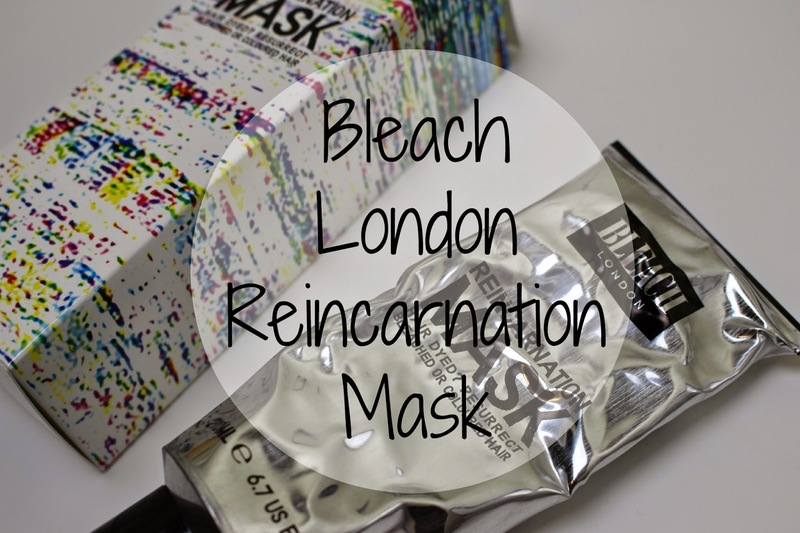 Bleach London are a brand I've drooled over for so long now. Their funky wash in-wash out dyes are a dream and I WISH I was in a line of work that made it okay for me to dye my hair whatever colour I fancied now and again - but I think if I rocked up to work with bright blue hair they probably wouldn't appreciate it. Boooo! Anyway enough about the fact I can't have cool hair......... the hair that I can have is blonde and blonde is what I've been for a long while now! I decided to go a bit blonder recently (I fancied a Teresa McQueen look!) and even though I knew what affect the bleach would have I went ahead and did it anyway! For the first few washes after having my hair done I'm not going to lie my locks felt extremely knotty and dry (you know that slight cotton wool feeling? - eek!) - even with lots of conditioner and my beloved tangle teezer, so I knew it was time to invest in something a little more intense. I had heard about this conditioning mask from Bleach a while ago was always intrigued to give it a go so when I spotted it in Boots half price at just £3 I snapped it up with utter delight. 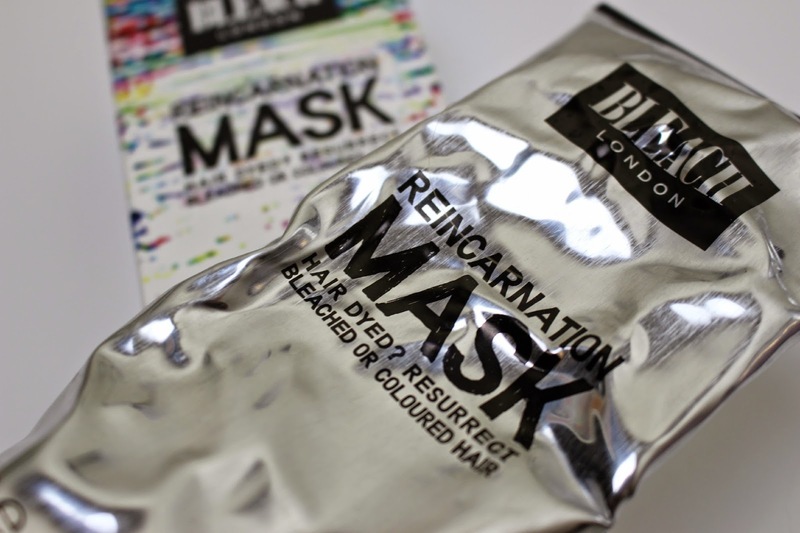 The Reincarnation Mask is a treatment to help resurrect and hydrate thirsty, bleached or coloured hair - Ding! ding! ding! Winner! The sunflower seed extract and micro wheat proteins help to improve the elasticity of the hair aswell as giving it great shine and helping reduce colour fade. I followed the instructions on the packaging and after shampooing and rinsing my hair I slapped this all over my locks root-to-tip! It says to leave on the hair for 10-20minutes .... I was actually doing this in a slight hurry so I probably only just managed 10 minutes (next time I will leave it on for alot longer!). It also says explains a great way to enchance the amazing results - by wrapping your hair in a warm towel and leaving it to work it's magic - I will definitely be trying this out at some point! As soon as I rinsed it out and ran my fingers through my hair I felt an immediate difference! I grabbed my tangle teezer and enjoy brushing through my hair for the first time in a week or so! This stuff is a god send for my bleached hair - it literally feels brand new! I'll be using this at least once a week from now on. If your hair is in need of some TLC and moisture then I highly recommend this stuff - it's only £6 normally and I think you'd get a good month's worth from each tube! p.s. aren't you just loving my new camera? I'm obsessed! £6 seems to be good value - I don't colour my hair, is it specifically for coloured hair or is it more of a generalised mask? nope you don't have to have coloured hair at all:) to me this mask is incredibly good and really similar to the kind of masks you get with box dyes! :) it's super conditioning so definitely try it!! I would love to turn my hair into a My Little Pony Maine, but i'm just to scared, and I don't think my boss would appreciate it. This mask looks great though, and will be perfect for when the sun dries it out in Summer too!